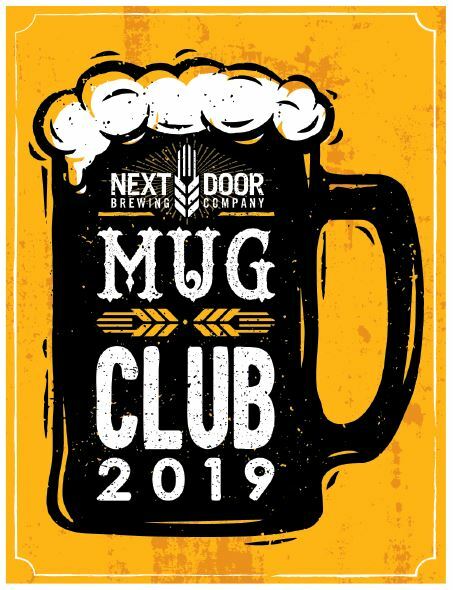 Mug Club - Next Door Brewing Co.
Our 2019 Mug Club membership are now available. Members receive 10% discount on food, all beer draft beer (including growler fills) and merchandise (shirts, hats, etc) Members also get access to ‘invite only events during the year which include: acess to pre-lease beers, sampling and providing input on the beers we make, mingling with other mug club beer aficionados and more. To purchase membership online click here. 100 MAXIMUM MEMBERS so order yours before they are gone.